Over the years I have failed in 4 business attempts. After learning from previous failures I have launch business blog Growthfunda while working into a full-time job. And now I am running it as my 5th successful business. And I love to answers it. 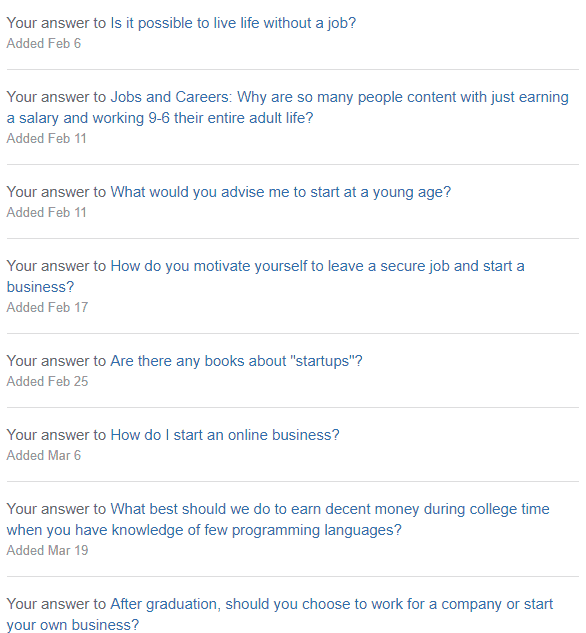 Why should I start a business as I am earning a decent salary in a 9–5 job. We Indian are born for doing hard work than smart work. We are living in a society where typical schooling and getting a good job is the primary means of the settlement in life. However, my dear friends whatever hard work you do for your employer none will make you rich as well as will not provide you with any kind of freedom. Most of us are doing a slave job for bread and butter. Everyone has own thinking and means of side hustle. I was also lived in same typical mediocre life unknowingly. I came from average family background and never thought that I will run an online business successfully. I worked hard to get good salary hike but always disappointed with the politics and the small % of hike every year. Over the 8 Yrs of my IT experience, I realized that everyone out here is struggling for something. — worried about kids schooling, marriage. — worried about uncertainty in a job. And like this, there are other obstacles in starting your own business and you are running in the RAT race of 9–5 job since years and years resulting in a mediocre lifestyle. Job is driving our lifestyle. You don’t know when your organization will stop loving you. Think of recession scenario where everyone has struggled to get new jobs. Despite struggle in getting job none of us thought to start a side hustle. What if recession-hit again or it may be possible that after a certain level of experience you are unable to get a job. Guys world is moving towards the automation, digitalization, robotics wherein after some years robots will take YOUR JOB. In that case, do you have plan B ready for your bread and butter? I guess NO… then this is the answer of WHY YOU SHOULD………..? What you are waiting for? You must identify your purpose of starting a business. What’s holding you from starting your own business? Rather fearing for the future life, start your own business today and live job-free life. As I am a big advocate of online business hence I am answering second WHY in terms of Online business. Freedom to Live and Ditch 9–5 Job Day job will not provide you a kind of FREEDOM, in terms of personal and financial life. Online business will be your path towards FREEDOM. Being an internet entrepreneur, you can roam anywhere, stay with your loved ones. You can ditch a 9–5 job and be your own BOSS. Plan B for Your Life Who knows when your organization stops loving you?. So while working you must prepare plan B of your life by starting your own online business. Spare some time on the internet to find out plan B of your life. In the longer run, this plan B will be your bread n butter. Flexibility Being an internet entrepreneur, an online business provides you with the freedom to live anywhere. You can start & run your own business from anywhere in the world. There are no obstacles to it. So in terms of offline business, online business is much easy to run. New Opportunities Along with your existing skills, an online business provides you with new opportunities. By showcasing your talent as blogger, writer, content writer, designer etc you can attract so many media, publications, and brand to give you freelancing opportunity. You can convert it easily into the long-term business. Also, you will get so many networking opportunities to connect with industry leaders and influencers. Learning Curve An online business provides you so many learning opportunities. Simple blogging will teach you writing, content marketing, designing, digital marketing, affiliate marketing, social media marketing, branding, influencers marketing and so on. So online business is an abundance of the learning curve and it removes your dependency from a day job. Make Money Most of the online business runs on autopilot so you need not to worry about getting money. Based on the work, your account gets credited with money on the specified date. Means you make money online. Paying Bills and Emi You must start a side business to pay bills, EMI and to reduce the financial burden. Your salary won’t fulfill your all dreams. Even if you are unable to grow business much still at least you can pay some bills and EMI by doing some side hustle like freelancing. Create Identity Online business grows and spreads very rapidly so you will get identity and chance to meet, connect new entrepreneurs around the world. It creates your identity Worldwide easily. Require Less Money or No Money Trust me or not, an online business requires less money or no money to start and grow. The Internet is the ocean and you can find lots of FREE tools, service to run a business. Initially, I only paid hosting & domain registration charges to build Growthfunda website. Easy to Start You will get huge forums, guides, tutorials on the internet to learn the online business from anywhere anytime. Gain Exposure to the Entrepreneurial Journey While working on side hustle you expose to many new things and that learning helps you to become a successful entrepreneur and makes you a better professional in almost any position. As mentioned above everyone have different reasons to start a business and I started MULTIPLE businesses due to my BECAUSE OF………. Don’t put your life in one basket which is called a JOB. Do you have Plan B ready for your life? Have you ever plan to start a business? 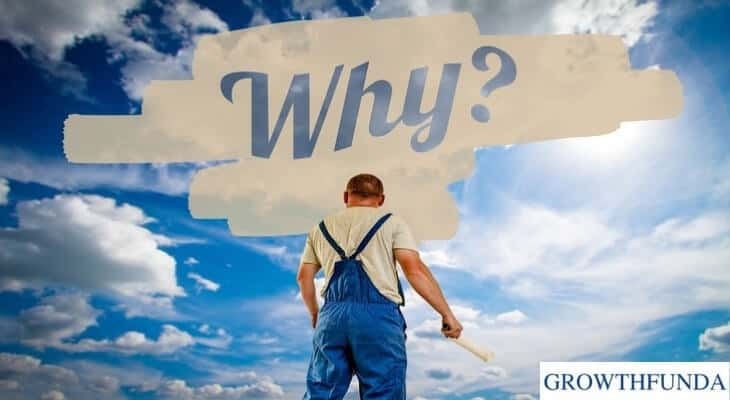 What is your reason to start a business? Have you ever tried to find the purpose of starting a business? If you like this post THEN do share it with your friends and family along with your thoughts in the comments. Really amazing article you wrote..
We have to found some earning opportunity that can makes our life better and joyful. Thanks for your descriptive article. Thanks, Bishnu keep reading, sharing & visiting to Growthfunda in near future. Yes, we have create multiple passive sources of income to escape from the RAT Race of 9-5 job. And today it’s so easy due to online business and opportunity like blogging,eCommerce, Selling e-Books, selling Information products, freelancing etc. The best form to learn all this business is to invest in self-learning and dedication.